Without realising it, we’re on autopilot almost all of the time, filtering information aurally, physically and visually at an amazing rate. Our nerve impulses to and from the brain travel as fast as 250 miles per hour, faster than a Formula 1 car! In a bid to make us aware of how much we take for granted sensorially, United Visual Artists designed Momentum: a sensory spectacle made up of a sequence of pendulum-like elements set throughout the 90-m-long Curve Gallery in London’s Barbican Centre, creating carefully choreographed sequences of light, sound and movement. 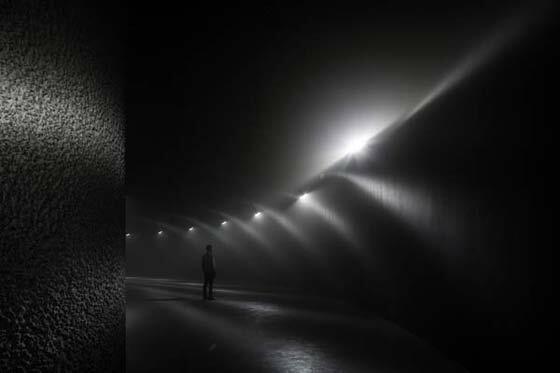 Matt Clark, the founder of United Visual Artists, said of the installation: ‘It is designed to mess with your perception of both time and physical space.’ Personally, I found it a meditative and even eerie environment – and one that certainly gave my sensory autopilot a good nudge! In Vienna, a heightened sensory experience can be found in the office entrance area of events agency Büro Hirzberger (created by Strukt Design Studio). 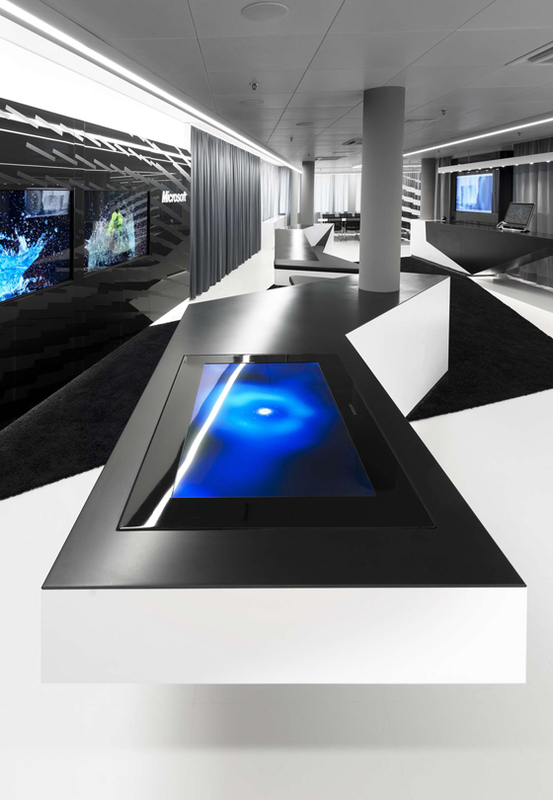 The space is encapsulated by digitally enhanced walls, which aim to capture the brand essence of Büro Hirzberger by using video projectors and vvvv – a hybrid graphical programming environment for prototyping and developing physical interfaces, real-time motion graphics and audio that can interact with many users simultaneously. 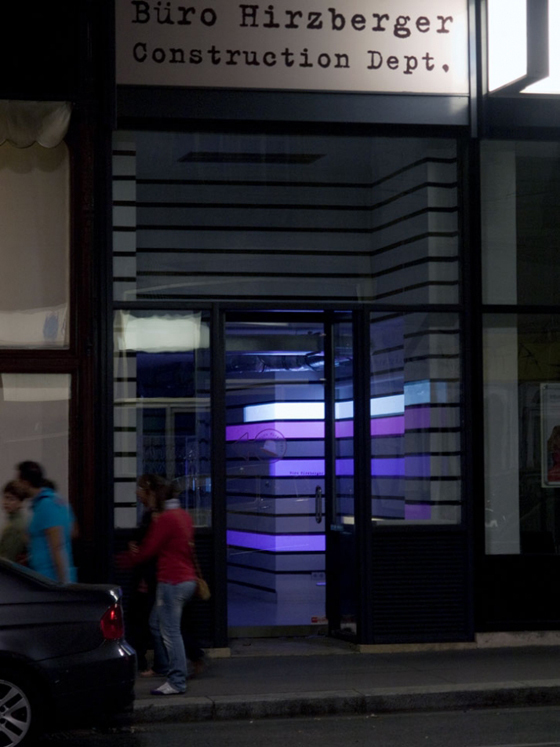 The installation’s content can also be made interactive, reacting to people passing the ground-floor office. Strukt Design Studio also developed the software to be interactive with the public, allowing passers-by the chance to stop and play for a moment – bringing the once ordinary wall surface to life. The result is a lovely illustration of how physical and digital design elements can combine to create immersive – even subtly branded – interaction experiences, establishing a space that inspires staff, engages visitors and even spreads brand awareness: more market share can follow from mind share after all. 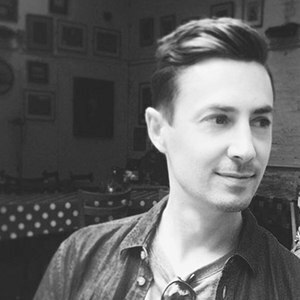 Recently, there have been many inspiring marketing projects that provide unique and memorable digital and physical experiences through advancements in audio and visual technology. One of note is by Future Colossal titled ‘a window into the near future’: a project for the launch of the new BMWi range. Future Colossal – an agency that thrives at the junction of art, technology and design – produced an interactive façade that transformed a street-level window into a digital reflection of passing traffic, transforming passing cars into BMW i3s and i8s. By generating a double-take augmented reality experience, passers-by were given a glimpse into the near future. A more explicit and informative take on a branded experience is by Control Group for the office entrance of Brookfield Asset Management. 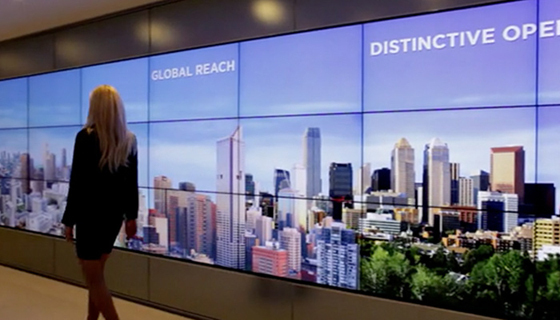 The foyer has a 50-foot interactive digital wall, which allows visitors to engage with information about the firm’s multiple offerings as soon as they step out of the lift. 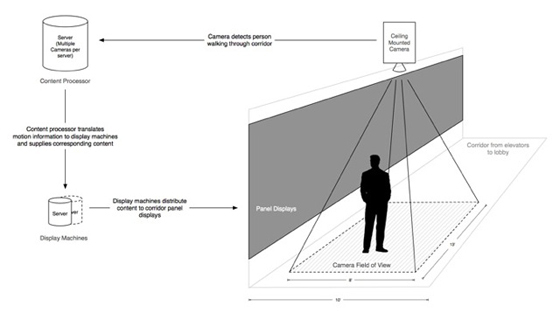 Motion sensors detect a person’s presence, and the more engaged viewers are with the wall, the more content they see. A wonderful way to communicate a corporation’s proposition and values, with both physical design elements and advanced AV technology. Another office entrance that places communication at the forefront is Microsoft’s Briefing Centre in Wallisellen, Switzerland, by Stuttgart-based practice Coast Office Architecture. The entrance area uses undulating furniture pieces to define zones for different types of communication, ranging from welcoming to product presentations and more formal meetings. A range of media walls enables employees to give presentations using the company’s various types of audio-visual technologies, which are integrated into the face of the mill work. Holography – sci-fi’s go-to AV technology – is the process of capturing three-dimensional images by recording patterns of light wave reflection. It dates back to 1947, when British scientist Dennis Gabor developed the theory of holography while working to improve the resolution of an electron microscope. Gabor went on to receive the Nobel Prize for his work in 1971. In 2012, Tupac Shakur – a rapper who died at the age of 25 in a 1996 shooting – was ‘resurrected’ via a computer-generated hologram, taking the technology from science fiction to science fact. 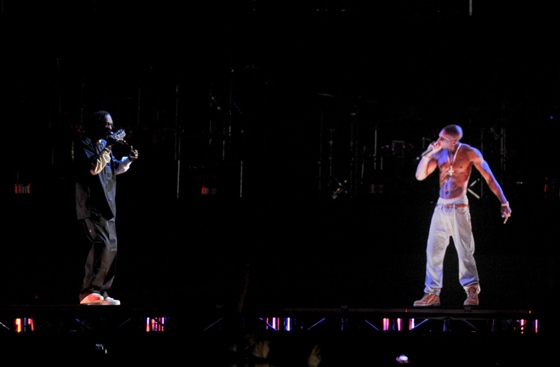 Tupac appeared ‘live’ on stage with Snoop Dogg at the Coachella music festival. The physical and digital reaction to the performance was explosive. The crowd could not believe their eyes and the event generated more than 15 million YouTube views within 48 hours. Moving forward, holographic technology is poised to have a real impact on the office environment and the way we work, revolutionising conference calls and presentations. Some of the companies behind the jaw-dropping holograms in entertainment performances are pushing innovations forward for the office environment too. 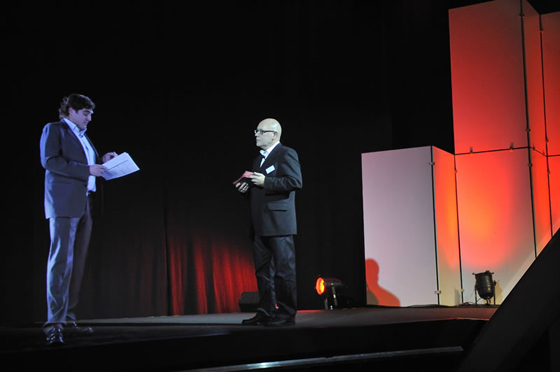 AV Concepts, the team that gave Tupac a new lease of life, and British-based Musion are notable leaders. Both have been experimenting with new forms of conference call to make telepresence a reality today. These advancements allow full-size holographic projections of people and objects in real time without any significant delay in communication – as long as your internet provider can handle it! These AV technological advancements led to Musion’s Guinness World Record-winning project that saw Indian politician Narendra Modi deliver a 55-minute campaign speech to 53 different audiences simultaneously in 2012. 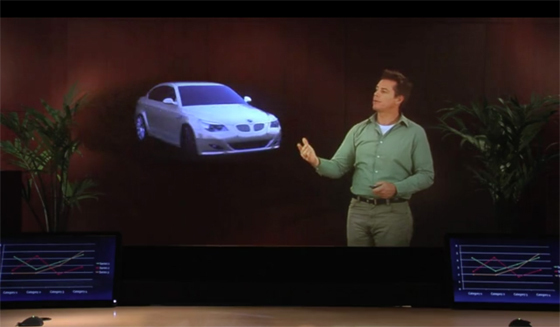 In January 2014, Digital Video Enterprises (DVE) announced the launch of the DVE Immersion Room: a first-of-its kind holographic presentation room, powered by Microsoft, allowing people to interact with video objects suspended in mid-air. No more excuses for dull and dreary presentations! 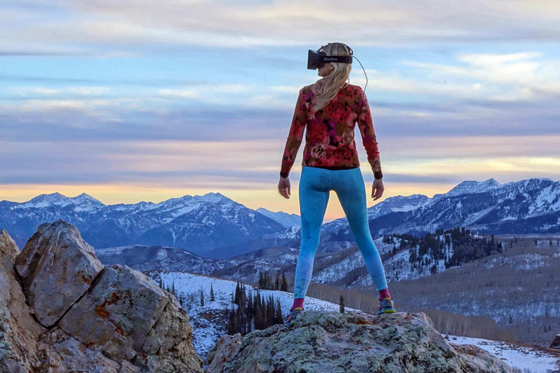 ‘This is the first time that we’ve succeeded in stimulating parts of the human visual system directly,’ according to Michael Abrash, one of Oculus Rift’s engineers. 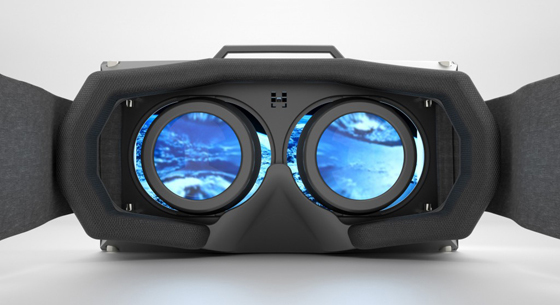 The project seized the imagination of many tech leaders, including Mark Zuckerberg: ‘Imagine enjoying a courtside seat at a game, studying in a classroom of students and teachers all over the world, or consulting with a doctor face to face, just by putting on goggles in your home.’ The project intrigued Zuckerberg so much that Facebook paid $2 billion for Oculus Rift in March this year. The advancement of audio-visual technology will continue to drive the seamless combination of offline physical space and online digital space, giving our sensory ‘autopilot’ a lot more than just a nudge and enabling truly 360° experiences for all our senses. This will transform our workplaces and ways of working, so keep your eyes and ears open!